There are several companies in the United States that provide the service at different stages of the electoral process (voter identification, acquisition of voting, counting, aggregation and transmission), but few of them have spread their technology throughout the country. Some of these companies are Election Systems & Software (ES&S), Dominion Voting (previously Sequoia Voting Systems) and Premier Election Solutions (Diebold), which are the software and hardware providers in the state of Alabama. ES&S provided two machines: AutoMARK and the model 100. The first can be used directly by checking the options on the touch screen and prints the vote receipt. It can also be used as a scanner for processing paperballots and has mechanisms that help the disabled exercise their right to vote. 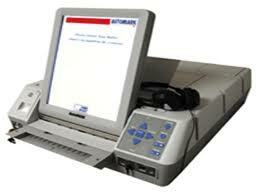 The second machine is an optical scanner that is used with ballot and tabulation machines. Dominion also offers two machines in Alabama. The AVC Edge II Plus, a touch screen machine with multiple options as adjustable legs for wheelchairs or zoom for people with visual impairments, but does not enable the printing of a proof of voting. The Optech Insight is a scanner that reads the ballot regardless of the position in which it is introduced, it rejects the record when the voter has marked more votes required in the process, allowing the process to be rectified. The company Premier has made two technology solutions for this state. AccuVote-TSX, is a touch screen machine that is activated when voters introduce a smart card (similar to a credit card equipped with a chip) and then vote. The selections are recorded in the internal electronic memory, but the paper record of the vote is not printed. The AccuVote-OS, meanwhile, is a scanner with the ability to transmit the count to an aggregation center. As in Alabama, other 49 states use similar equipment with different reach, provided by various companies. The electoral technology market in this country promises more developments to come and the adoption of proven systems in other countries, to strengthen the electronic voting system, the more efficient and transparent method that exists. Unlike Latin American countries, where the governing body of an election, states and applies the system stated by the Law to hold an election in a country, in the United States the decision is in the hands of local authorities (counties), with which are over 3140 different electoral mechanisms are deployed. 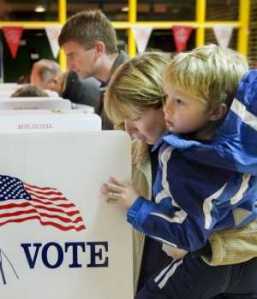 In the November elections, the American nation patented the use of new voting technologies. Touch screens, but with no paper record of the votes, and paper ballots and optical scanners for counting, replaced in many states the old punch card systems. In the year 2000 these systems where challenged after being used for decades, for the errors made on the identification and counting processes. To have a better understanding of the electronic voting versions used by the US, the Verified Voting Foundation has stated that the country uses several variants of at least three computerized voting procedures. The system used by 66.74% of the almost 181 million voters in the country, is a mixed scheme, as it contains traditional paper ballots that must be marked by each voter, but are counted with technological devices. There are two ways to accomplish the counting process, one is when the ballot is carried by the same voter to a scanner that tabulates the votes at the polling place, and is used by 37.38% of the country. In other cases, the ballot is placed in an urn which is then transported to a counting center. The screening device identifies the marks made by voters on the cards and records the votes accordingly. There are also locations where the sum is done manually. The second method of electronic voting is represented by the so-called Direct Recording Electronic (DRE), which is used by 33.22% of voters. 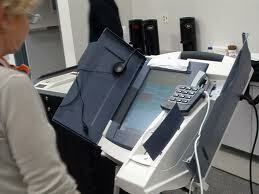 It is a touch-screen machine on which voters mark their ballots directly. This systems have at least three variants: the first is the equipment that prints a paper record of the vote, representing just 8.13% of the voting population, and the ones that do not allow the issue of proof which amounts to 24.90% of the electorate .There is also a third type, which supports printing or not, but its use is determined by the authorities and represents only 0.19% of voters. The third possibility of electronic voting is nearly eradicated. It is the much criticized punch-card scheme, which is still used in very few areas. It represents only 0.04% of the voters. These three systems and their variants are applied simultaneously in the United States. Although advances have meant big changes, especially in 2010, pressure groups and political movements still insist that the technology needs improvement, as “dark areas” remain that could light up, if for example the use of equipment that enables the issuance of receipt or proof of their vote is formalized, so that each voter could verify that the candidates they have voted for on the screen is the same as was the one recorded in the machine’s memory. This and other issues of electoral guarantees will continue to be discussed and claimed for, because voting technology still has much to offer to the U.S. The cost of electronic voting continues to be a controversial issue in some countries, especially in those such as Peru and Colombia, where e-vote is currently being implemented. One of the strongest arguments that have arisen this year in favor of automated elections and the initial investment they represent, was exposed by the Manager of Electoral Systems and Informatics of the Peruvian National Office of Electoral Processes, Jorge Luis Yrivarren. He stated that with this mechanism, the costs in the voting places of different electoral districts are reduced or even eliminated. This is possible because of the paper is not used and because of the reduction of the number of polling stations. “Undoubtedly, the voting ability that an electronic table has is higher than a traditional or manual table, where there is a maximum of 200 voters and the waiting queue is greater. For example, an electronic voting table can have four cabins and, if there are over 600 voters as a maximum, each table can serve 2,400 people. That’s part of the savings”. Yrivarren added that installing an electronic table takes 15 minutes, similar to the time it takes to close a table after the set time. Yrivarren listed success stories of electronic voting in India, Philippines, Belgium, Brazil and Venezuela. He also commented on the process of Estonia and Indonesia, where non-contact electronic votes via the Internet were employed. In Estonia, the remote vote was used by the citizens residing in that country who wanted to vote in parliamentary elections of June 2009. Because of the characteristics of their ID documents, voters had to buy a $ 10 electronic reader to connect data to their computer so it could read the electoral document, which included an electronic signature and password. This payment was directly made by the census. Another nation that also investigates the economic impact of electronic voting is Mexico. The special committee of the Federal Electoral Institute presented a report on its feasibility. One of the conclusions of the report is the complexity of calculating the cost of their introduction claiming that it depends to a large extent on the scope of legal reforms. They estimate that the inclusion of 666 thousand electronic voting machines for the 2012 pilot program, would cost around 17.8 million pesos ($1.43 million) and 76.3billion pesos ($ 6.15 million), according to the modality. 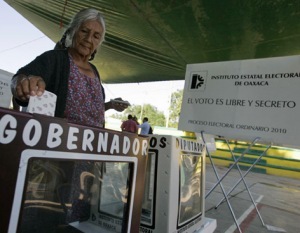 The study published in the Mexican journal La Jornada reports that the institute forecasts point to install four electronic voting machines in each of the 300 electoral districts (1.200), which will also have one more for training purposes. 10% will also be added as a reserve and will include 16 teams to assign them for the vote of Mexicans abroad. Ecuador is another nation that has been widely discussed cost and the implementation of electronic voting. The former president of the late Supreme Electoral Tribunal (TSE), Carlos Aguinaga, stated in January 2009 that an electronic voting system in Latin America is at an average of $ 8 per voter. “From there you can find more expensive or cheaper systems, taking into account that it will be deployed in 100%”. Returning to the Mexican case, some experts say that although the implementation of e-voting is a high investment, it is also represents long-term savings. This appreciation is related to the fact that the transformation requires to disburse a considerable sum of money in equipment, human resource training and voter education for the adaptation of voters. However, once the system is automated, the costs reduce significantly because the amounts for the following processes are mostly related to maintenance of the technological platform, but not so the imprinting of ballots, adequacy of thousands of tables, and the staff required to deliver the vote is significantly reduced. An interesting case is the primary elections in Venezuela. They show a clear example of the savings an automated election gives to a nation versus the manual elections. When political parties have conducted primary elections, the automated election budget provided by the National Electoral Council has been presented three times lower than the one offered by other companies to make the election manual.